Daisy White is a health advocate and wellness coach whose mentors include Dr. Klinghardt. Daisy has experienced Lyme disease first hand having struggled as both an undiagnosed patient attempting to convince doctors that she was actually ill, and as a diagnosed patient weaving her through the maze of healthcare providers on her road to recovery. Read more about Daisy’s story and her work here and she has clients from all over the world. 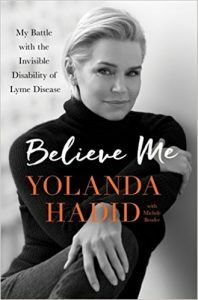 Daisy’s clients include Yolanda Hadid whose book ‘Believe Me: My Battle with My Battle with the Invisible Disability of Lyme Disease’ details her journey to recovery and Daisy’s crucial advocacy work which played such a huge part. Thank you to Daisy for taking the time to answer our group members’ questions.